The following framework has been developed to cultivate a shared understanding of the purpose regarding technology use in the classroom, and to identify what we envision students and staff doing as a result of increased access to technology through the Technology for Learning Initiative. 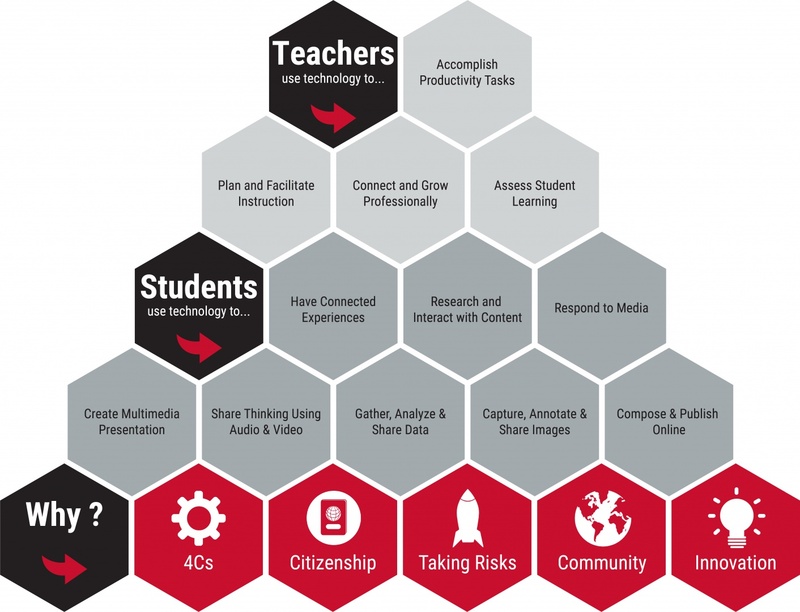 This framework represents the concepts and skills that form the foundation and focus of Technology for Learning professional development for staff. 4Cs: A technology-rich classroom will provide opportunities for our students and staff to communicate, collaborate, think critically, and create in ways that have not been possible in the past. Citizenship: A technology-rich classroom will provide opportunities for our students and staff to be active digital citizens and to develop a positive identity in the digital world. Taking Risks: A technology-rich classroom will provide opportunities for our students and staff to take educational risks in ways that have not been possible in the past. This can be leveraged to promote a culture that supports a growth mindset. Community: A technology-rich classroom will provide opportunities for our students and staff to contribute to the larger global community, while communicating and collaborating with peers and experts beyond the walls of the classroom. Innovation: A technology-rich classroom will provide opportunities for our students and staff to innovate in ways that have not been possible in the past. Innovation is the creation of something new through invention or iteration. Have Connected Experiences: Students will have opportunities to use technology to connect with peers, experts, authors, and places for the purpose of learning and/or creating something new. Research and Interact with Content: Students will have opportunities to utilize multiple online search tools and interact with specific content related to learning (e.g. simulations, models). Respond to Media: Students will respond to a piece of media in class in an online space. Create Multimedia Presentation: Students will have opportunities to utilize media (images, video, text, audio, etc.) to create a presentation articulating new learning with the opportunity to share with an audience. Share Thinking Using Audio & Video: Students will use audio and video tools to record their thinking and then share that thinking with an audience. Gather, Analyze & Share Data: Students will use digital tools to collect (or locate) data, analyze or evaluate that data and to share that data. Capture, Annotate, and Share Images: Students will capture their own images, and then utilize tools to annotate and share those images. Compose and Publish Online: Students will utilize tools to compose writing online and publish their writing for an authentic audience. Accomplish Productivity Tasks: Teachers will use technology to accomplish productivity tasks such as document creation, digital organization, email communication, entering grades, report cards, etc. Plan and Facilitate Instruction: Teachers will use technology to plan instruction (locating resources, organizing resources, lesson creation, etc.) and to facilitate instruction (e.g. multimedia presentations, interactive technologies). Connect and Grow Professionally: Teachers will use technology to develop a personal learning network (PLN) to support their growth as a professional (e.g. Twitter, Facebook, Blogs). Assess Student Learning: Teachers will use technology to assess student learning (formative and summative) and to make instructional decisions based on the data.